This image depicts human waste in sealed cans. Tracing material and metaphoric waste through the Western canon, ranging from Beowulf to Samuel Beckett, Susan Morrison disrupts traditional perceptions of waste to better understand how we theorize, manage, and are implicated in what is discarded and seen as garbage. Engaging a wide range of disciplines, Morrison addresses how the materiality of waste has been sedimented into a variety of toxic metaphors. The vibrancy of matter itself disturbs these metaphors, especially those used to characterize people as disposable garbage. If scholars can read waste as possessing dynamic agency, how might that change the ethics of refuse-ing and ostracizing wasted humans? 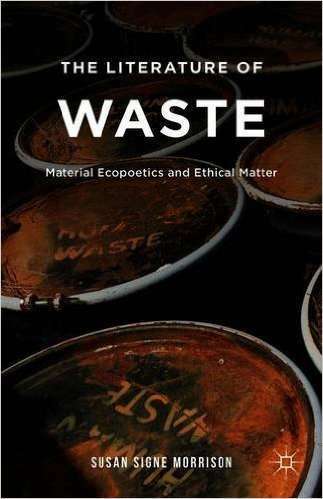 A major contribution to the growing field of Waste Studies, this comparative and theoretically innovative book confronts the reader with the ethical urgency present in waste literature itself. "An unparalleled work of literary and cultural criticism....The Literature of Waste makes a strong argument for why the humanities matter - and why the matter the humanities explores must also include waste." "An unparalleled work of literary and cultural criticism, The Literature of Waste brings together the new materialism, ecocriticism and environmental ethics to articulate the transformative and trans-temporal project of waste studies. Wide ranging, lucidly composed, and original, the book inspires and provokes. With its emphasis on aesthetics, ethics, literature, and community, The Literature of Waste makes a strong argument for why the humanities matter - and why the matter the humanities explores must also include waste." "'These fragments I have shored against my ruins,' writes T.S. Eliot famously in The Waste Land. This phrase beautifully describes both the mélange of cultural residue that constitutes modern civilization and the concatenation of disparate sources that informs Morrison's lively, profound, and encyclopedic The Literature of Waste. This is a book that builds wisely upon recent materialist trends in ecocriticism and helps to chart the future of the discipline. I have a new appreciation for the meaning of waste after reading this work." "Building on her seminal work exploring Chaucerian fecopoetics, Excrement in the Late Middle Ages, Morrison extends her brave march into the deepest and dirtiest corners of history's societal relationship with waste. From exploration of conspicuous consumption as a 'means to repute for a gentleman' to the metaphors of sin implied in uncleanliness, Morrison shows that all that litter is indeed - not gold. Having spent a year thinking about waste from my home inside a trash dumpster, I'm intimately in touch with the space that material waste occupies. If only I'd had this book to ponder whilst in the can, I might have found my nights less wasted by fear of impending doom from trash trucks and more filled with beautifully fragrant prose of meaning. You will be enlightened and delighted by this book." "In a novel act of textual recuperation, The Literature of Waste admirably confronts one of the most perplexing facts of human existence - our discomfiting entanglement in waste - and opens it up to new and transformative possibilities. The thing about waste, Morrison reveals, is that it can become a most vital ally in confronting the ethical dilemmas ahead as we attempt to meet the demands of living now in more sustainable ways." "Susan Signe Morrison is a pioneer of 'fecocriticism,' a brave and original mode of literary scholarship. She draws upon anthropology, archaeology, ecology, psychology, and history in order to argue for the centrality of waste in our lived experience and its consequent immanence in literary artefacts from Beowulf to The Great Gatsby. She brilliantly shows how the concerns raised by waste operate in ubiquitous ways across various spheres of human experience. But the greatest achievement of The Literature of Waste is its commitment to the ethics of cultural criticism. Forceful and refreshing, Morrison's work is, ultimately, profoundly moral." [M]y understanding of waste has been greatly expanded by Susan Signe Morrison’s The Literature of Waste: Material Ecopoetics and Ethical Matter….I think her book can help bring readers to a better understanding of waste....Her final two chapters on source reduction and reuse articulate a clear vision of how poetry might help humans to see waste in all its forms as ethical matter, calling for action....Her work brings together Walt Whitman, Ammons, and Italo Calvino along with Chaucer and others in an exciting and awe-inspiring assemblage. The Literature of Waste also offers valuable commentary in thinking about intertextuality as a kind of recycling, the dangers of seeing certain groups of humans as waste, the dependent relations a city has with rural landscapes concerning waste disposal, and the pressing problem of conspicuous consumption and the often hidden increase in waste it produces. As I was trying to dig through Morrison’s midden heap of literature, theory, and history, I found myself constantly struck by poignant insights and thoughtful articulations, especially her work on early modern and medieval texts. In terms of ecocriticism, the book is a great example of interdisciplinary thought that seeks to address environmental crisis.....Scholars and readers interested in material culture or any of its various offshoots will find much of use here while those interested in garbage more generally will also find this book a useful introduction to thinking about waste.